It’s been five years since Grand Theft Auto V came out, so naturally it’s time to start asking when the next game in the series is coming out. We have no official word from developer Rockstar Games about the state of its most popular series (probably because it’s preoccupied adding “extra polish” to upcoming Western Red Dead Redemption 2), it remains up to fans to speculate and plan out what we’d like to see from the next game in the series. As for me, I think the series needs a female protagonist. GTA‘s core story has always been about exploring the tarnished American Dream through the lens of frustrated masculinity; a bloody, hyperviolent combination of Fight Club and The Great Gatsby, if you will. By the time GTA V rolled around, the three protagonists were a study in self-reference: Franklin was a gang banger, in the vein of San Andreas‘ CJ. Michael was a career criminal more in the line of Claude or Niko. Trevor was basically an embodiment of all the things GTA players do because they can: an amoral, pyromaniacal psychopath. Every permutation of Rockstar’s typical leading man was explored, deconstructed, dissected, and thoroughly mocked. My point is … we get it. Rockstar has done that particular character incredible justice multiple times. So why not go in a new direction? I suspect some readers will have an instant reaction of revulsion and dismissal — we’ll be charitable and say it’s because they don’t like change. To be fair, it can be hard to see the addition of a female protagonist in a traditionally male-centric franchise as anything other than a novelty made to satisfy a subset of fans. Don’t misjudge my intentions just because I’m a woman: I have no interest in having a female protagonist just to have someone with whom I, a possessor of female characteristics, can identify. I don’t want an ideologue — I want a character. When I say I want a female protagonist, I mean that I want one for whom being female is as much a part of her identity as masculinity is for every other main character. If GTA and its history of hookers and shrieking girlfriends has proven anything, it’s that the criminal underground is not gender-neutral — who and what you are matters. A female career criminal will have had a different path in life than someone like Franklin or Niko, and it’s a path the series has never explored. What got her into the lifestyle? How does she operate? What different challenges would she face? Any of those questions would make a great story, different from the ones we’ve got so far. Besides, the basics need not change at all. 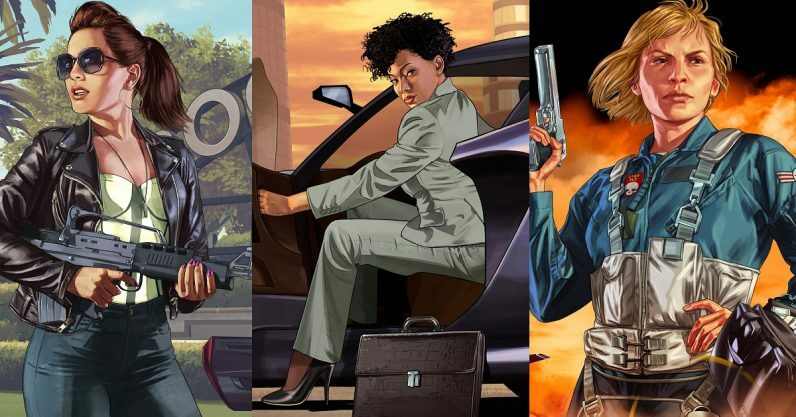 GTA Online and its female characters have shown that you don’t need to possess testosterone in order to drive a car, pull off a heist, or lay waste to an entire city block with an assault rifle. If not done well, the choice to make the protagonist female could go over like a square wheel, a pointless rejiggering done by a team bereft of ideas. But if it’s done right, it could be a fresh take on Rockstar’s usual story — a fresh take the series sorely needs if it doesn’t want to retread its greatest hits. An alternate proposal one of my colleagues suggested was to have a character creator in which gender is an option. Technically, this has already been done in GTA Classic, the top-down game that shocked the 90s. You could play as a male or a female criminal in that game. That’s also the case in GTA Online, but I don’t count that as its a completely different animal. While I consider that a good alternate idea, I don’t know if it’d go over so well in Grand Theft Auto. It’s been done, and done well, but there’s a reason I don’t think it’d work in this series. If you want a good example of an open-world crime game with a character creator and a fun story, you should play Saints Row. From the second game on, you could play as either a male or female character and it had no impact on the story. Here’s why I don’t think it would work: Saints Row is nuts. That series is nonstop madcap action that makes GTA look as sober as a John Steinbeck novel, and it doesn’t give a fifth of a flip what you think of it. GTA, no matter how hard it tries, isn’t that detached. Its stories are too steeped in reality, even if it’s a satirical version of reality. And single player stories in GTA are all about the characters. Having a story with a gap that could be filled conceivably by any kind of character — as is the case with games with character creators — would be to do a disservice to the series. Besides, we already have a game like Saints Row. It’s called Saints Row. It’s a brand of screwy, unhinged lunacy even GTA can’t touch, and the latter would be lesser for trying. We aren’t catching that crazy lightning in a bottle again. Grand Theft Auto is one of the most profitable, successful video game franchises of all time. It can either stay static and spin its wheels (like some series I could name *cough ElderScrolls*), or find new ways of telling its story. I think it can afford to take the chance on a new formula. Having a woman as the leading character in the next game would be a shake-up, it’s true. But I think it’s one both the series and its fans could pull off.